LP Oliver & Son's, Inc. Comment: I would like to get an estimate for Furniture - Upholster. Comment: I need slipcovers for 2 club chairs. Comment: I have a headboard that needs a lift. I'm in a mid-century style home but this headboard is more grandma's hand-me-down in chintz. Comment: we have about 2 antique lawyers bookcases that are 4 units each and some of them are coming apart. Some need to be fixed so they will fit nicely on top of one another. Comment: We have a roughly 65 year old Danish Modern style blond wood dining table that needs refinishing. It's solid wood. It's a folding table that at it's max, comfortably seats ten but that folds up to about 8 inches wide and the natural width of the table. It badly needs restoration including removing a heavy stain or two, smoothing out the surface and varnishing, shellacking, whatever the right term is. 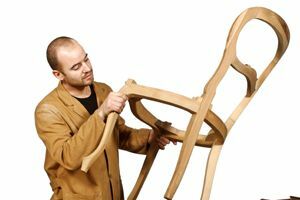 Bethesda Furniture Repair Services are rated 4.71 out of 5 based on 418 reviews of 14 pros. Not Looking for Furniture Repair & Refinish Contractors in Bethesda, MD?